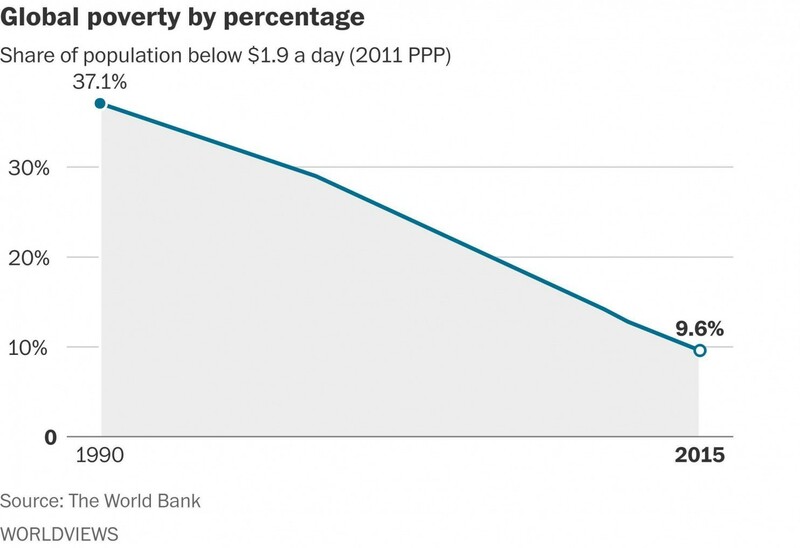 VERY GOOD NEWS: EXTREME POVERTY DOWN FROM 37.1 TO 9.6 PERCENT! According to the latest estimates, extreme poverty, defined as earning less than $1.90 a day, has fallen from 12.8 percent of the world’s population in 2012 to 9.6 percent of the global population in 2015. Jim Yong Kim, president of the World Bank, said in a statement that for the first time in World history the goal to eradicate poverty is coming into sight. The progress is astounding. As recently as 1990, more than 37 percent of the world’s population was living under conditions of extreme poverty. The number has come down rapidly in recent decades despite a population growth of almost 2 billion people in the same period. The main reason for the declining number is to be found within the rapid economic growth in Asia, but Africa is also showing positive development, especially in urban areas. Poverty remains a serious problem in Sub-Saharan Africa, where the rate remains above 35%. Many people are not aware of this positive development that goes hand in hand with the sharp decline in fertility rates and great improvements in literacy. On average the global fertility rate has declined to a sustainable number close to two children per women. At the same time more than 80% of all adults can read and write. Africa again is the exception, with higher fertility rates, and lower literacy persisting in many parts throughout the continent. It by far presents the greatest challenge in the global fight against poverty.